The spice rub adds an exotic flavor to the meat. 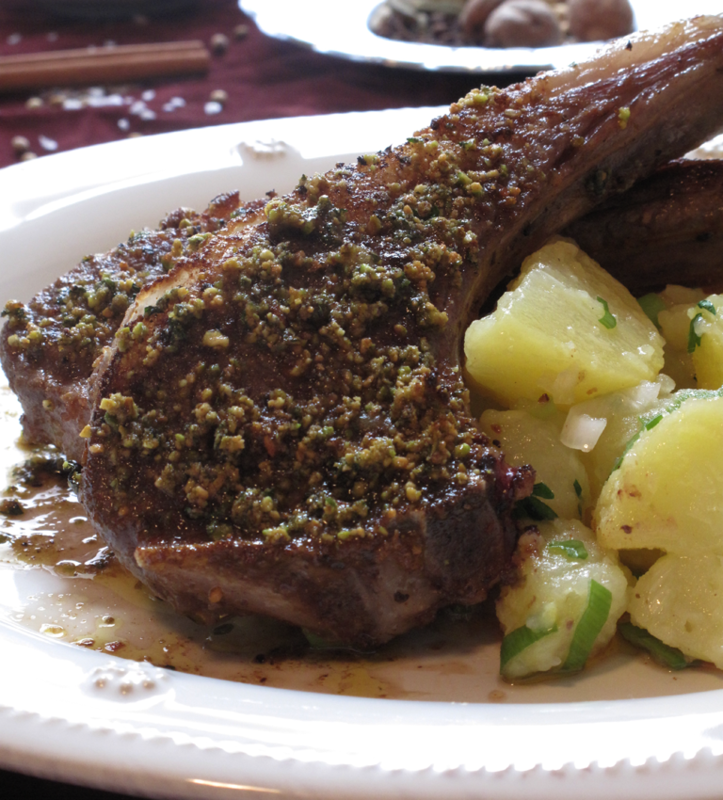 The finishing mint-pistachio mix makes the juicy chops mesmerizing in taste and look. 1Put the pistachios into a food processor and pulse several times to grind. Add diced mint leaves and mix well. Transfer the mixture onto a large dinner plate. 2In a medium size pot place the potatoes and the herbs. Bring to boil. When start to bubble lower the heat to simmer and boil until tender. Remove them from the hot water. Once the potatoes are cool enough to handle, peel the skin off. It’s much easier to do it before they cool down completely. Cut the potatoes into 1” cubes and transfer them to a glass salad bowl. 3In a small cup mix kosher salt and freshly ground black pepper, vinegar and the scallion. Add the vinaigrette over the potatoes and with a spoon mix gently until all potatoes get moist. 4In a mortar combine all ingredients and coat well both sides of the lamb chops. Leave them in the refrigerator for 30 min. 5Preheat the oven to 400 F.
6Heat ½ tablespoon olive oil in a pan over medium heat. Add the lamb chops and cook each side for 2 min. Remove the chops from the heat and place them into the pistachio-mint mixture. Using your fingers press the mixture firmly onto the chops. Transfer the lamb chops to the baking sheet. 7Roast in the oven for 5 minutes for medium rare or until the cooking thermometer indicates125 to 130 degrees F.
8Arrange in a plate with the potato salad and serve.